Set in a fanciful version of the American Old West, Sunset Riders revolves around four bounty hunters who are out to claim rewards given for eliminating the most wanted outlaws in the West. There is no true "storyline" aside from collecting progressively larger rewards. 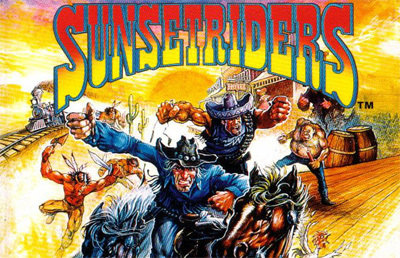 Sunset Riders is similar to other run and guns, such as Konami's Contra, but with less emphasis on jumping and a greater focus on shooting. The game includes a total of four playable characters to choose from: Steve, Billy, Bob, and Cormano. The characters are slightly differentiated: Steve and Billy use revolvers, Bob carries a rifle, and Cormano is armed with a shotgun. The rifle and shotgun shoot somewhat slower than their revolver counterparts, but have a wider spread, making them ideal for taking out enemies without too much precise aiming. On the full-size arcade cabinet up to four players can play simultaneously, each as a different character.